The Cancer Center Isolation Facility (CCIF) is a 30,000 square foot, stand-alone building dedicated to cancer research that provides a physical plant able to support work with hazardous materials at biosafety level 2 or 3, recombinant DNA, chemotherapeutics, as well as the maintenance of immunosuppressed and specific pathogen free rodents. The building includes: a) eight modules containing: 3 lead lined rooms, 27 animal holding rooms, and 6 laboratories; b) support areas for mechanical equipment, e.g., cage washing equipment, and c) 22 operational autoclaves. Each of the eight modules has an airlock to ensure containment and prevent cross contamination. The heating, ventilation and air conditioning (HVAC) system provides 100 percent fresh HEPA filtered supply air to the modules. Exhaust air is not recirculated and is HEPA filtered prior to being exhausted from each module. Class 1, 2, and 3 biosafety cabinets are available in these modules for handling hazardous chemical and biological materials. Charcoal filters are used with HEPA filters to exhaust air from the rooms where chemical carcinogens are handled. Each module is equipped with double door pass through autoclaves and double door pass through boxes to decontaminate equipment. The support areas include: two cage wash rooms equipped with two double length rack washers and a glass washer; locker rooms and lavatories for men and women; administrative offices, a break room, environmental services closet, and staging area for the preparation and storage of equipment. Biologically contaminated liquid waste is collected in two 2600 gallon underground concrete effluent tanks where it is treated with concentrated chlorine for two hours to achieve decontamination before disposal. Hazardous solid wastes are steam sterilized. An incinerator is available for incinerating chemical carcinogen waste. The CCIF is staffed with 16 Comparative Medicine Specialist (CMS) technicians, who provide animal husbandry and support services for the facility. All animals receive health assessments and any necessary veterinary care daily, including weekends and holidays. Accessibility. The CCIF operates on a 24 hours a day, 7 days a week schedule. Investigators and their staff have access to their animal holding rooms and/or laboratories at all times through security access proximity card readers. DCI members are given priority for assignment of space in CCIF. Request for Use. Investigators wishing to utilize space in the facility submit a request describing their experimental needs to the CCIF Scientific Advisory Committee via Mr. St. Pierre and Dr. Bigner. Each request is reviewed by the Scientific Advisory Committee for its relevance to cancer biology and the mission of the DCI. Laboratory hazards are reviewed and a risk assessment is determined by Dr. Bigner, Dr. Norton and the Occupational and Environmental Safety Office (OESO), directed by Dr. Wayne Thomann. Based on these evaluations as well as the space and equipment needed by the investigator and facility availability, the Scientific Advisory Committee makes a recommendation to Dr. Norton, who is responsible for making all space assignments in the facility. 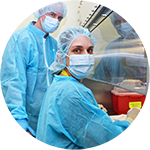 Space assignment is generally made on a first-come, first-served basis to DCI members with peer-reviewed cancer research funding. Per diem charges are used to recover the cost of the staff necessary to meet users' needs, including animal care and routine facility maintenance, as well as costs of caging, food, bedding, equipment and personal protective equipment needed to operate in the facility. Procurement of food, bedding, personal protective equipment and any other husbandry supplies is centralized through the Operations Manager, Mr. St. Pierre. The current per diem rate for CCIF users is $0.88 per cage per day. Monthly billing is handled by DLAR administrative staff.